Most weddings, celebrations, events or corporate entertainment involve refreshments, so bar hire will probably be something that you will be considering. 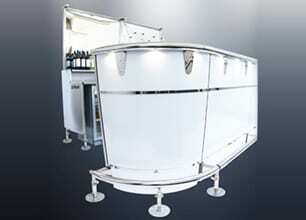 For a long time we have been searching for a portable bar hire system which enables us to provide a high quality, good looking bar, which is also a functional space for the staff using it …we have now found the perfect bar! The purposely designed front bar features a black resin counter top and a white frontage with sleek chrome finish and LED down lighters. It’s a great looking bar that is perfect for weddings, sitting well with any décor, whilst adding a bit of sophistication. For staff using the bars, there is a stainless steel working area specifically designed with their needs in mind, making service easy and efficient, meaning no one will go thirsty! 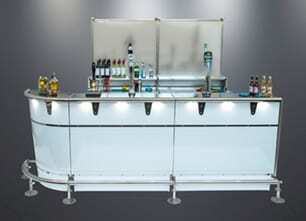 As standard we can provide bar hire in two lengths, either 3m or 6m, and it can be delivered and set up by our team ready for you or your caterer to stock! However, the system is really flexible, being made of 1.2m modular lengths and 90 degree angles which means that we can offer a variety of bar hire shapes for larger events. So whatever your requirements contact us and let us know about your event requirements and we can advise you on the best bar hire solution. We also have a rustic bar for those who are looking to a different style. It is about 7ft long and will add a load of country charm to your marquee – great for combining with our rustic wooden trestle tables.